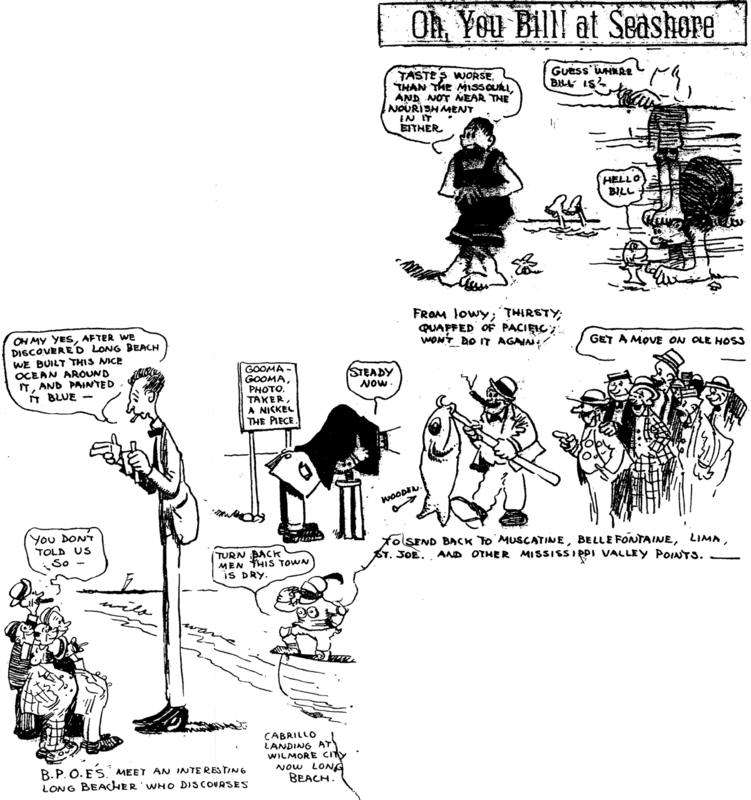 July 15 1909 -- Another Herriman cartoon about the Elks convention, happening in and around L.A. The microfilm was pretty messed up on this page, and given that the cartoon is of minimal interest 119 years later, I elected not to take a few hours of my life to try to clean it up beyond the basics. Here's another card from that Marriner copycat we saw back in March. Just like the other one, there is no publisher credited, and the postmark (once again really faint) seems to be 1910. When World Color Printing began sharing many of the Philadelphia Press Sunday comics (Hairbreadth Harry, Mrs. Timekiller, Clumsy Claude, etc.) in 1911, they were able to produce a complete four page Sunday section with very little additional content. Along with their flagship feature, Slim Jim, the only other comic strip they kept producing was Mr. Boss by an excellent cartoonist who signed himself 'Rutledge'. Thanks to Alex Jay, we've already identified the mysterious Rutledge -- he is Frank Rutledge Leet, one of the mainstays in the NEA cartooning bullpen at this time, and obviously moonlighting at WCP for a few extra bucks. Mr. Boss was a pretty good strip, with highly animated barnyard animals the characters, and a typically egotistical rooster getting star billing. Lots of raucous physical humor with a minimum of gabbing makes this one a winner. 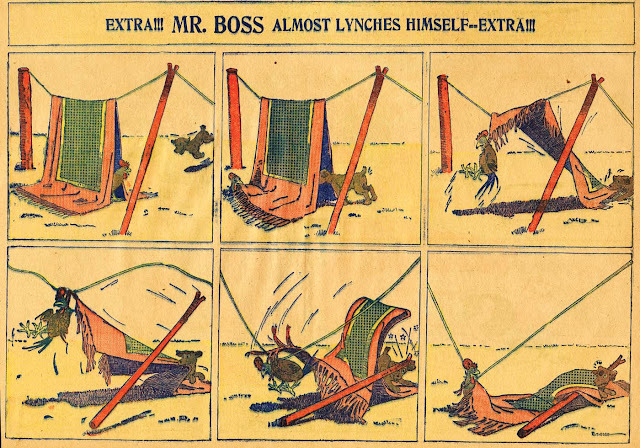 Mr. Boss began in the WCP section on November 14 1909, and survived the great content purge of 1911. The strip kept running until May 18 1913, when Leet decided to try something different. His new strip was called Duke -- a real stinker of a strip about a pony. In my book you'll see this strip listed as Mr. Boss and Mr. Reynard, and a note there says that the Mr. Reynard character began to get co-billing in late 1911 or early 1912. 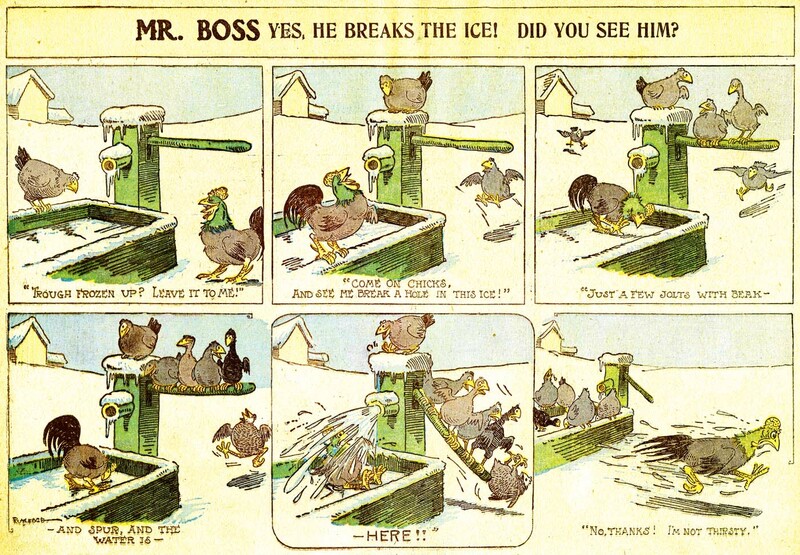 Okay, so I don't know what sort of wacky weed I was smoking that day, but I can no longer find any evidence that a Mr. Reynard was a character in the strip except once on February 19 1911. So it's time to get the ol' Marks-a-Lot out, and do some surgery on that listing. Everything else is okay, but drop Mr. Reynard from the title and black out my completely errant comment. 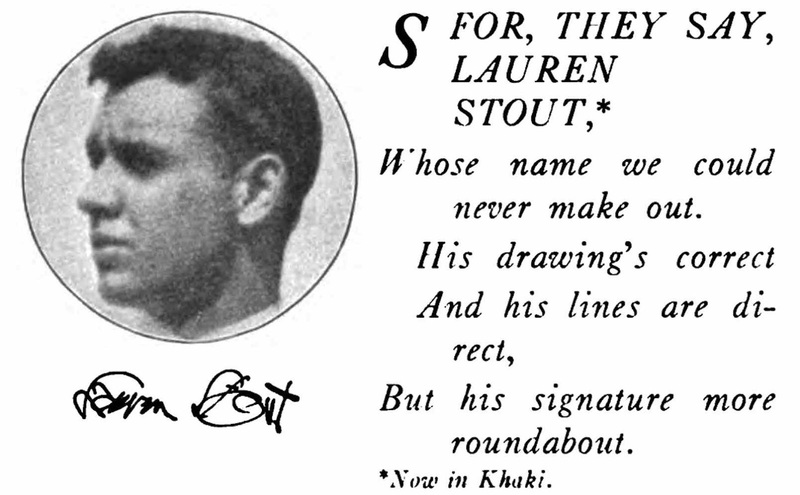 Lauren O. Stout was born on June 4, 1887, in Winston, Missouri, according to his World War I and II draft cards. In the 1900 U.S. Federal Census, Stout was the youngest of two sons born to S.H. and Barbara. His father was a stone mason. They resided in Kansas City, Missouri at 1918 East 14th Street. Information about Stout’s art training has not been found. The Kansas city directories from 1902 to 1909 listed Stout as an artist living at 1624 Jackson Avenue. The same address was recorded in the 1910 census and city directory. 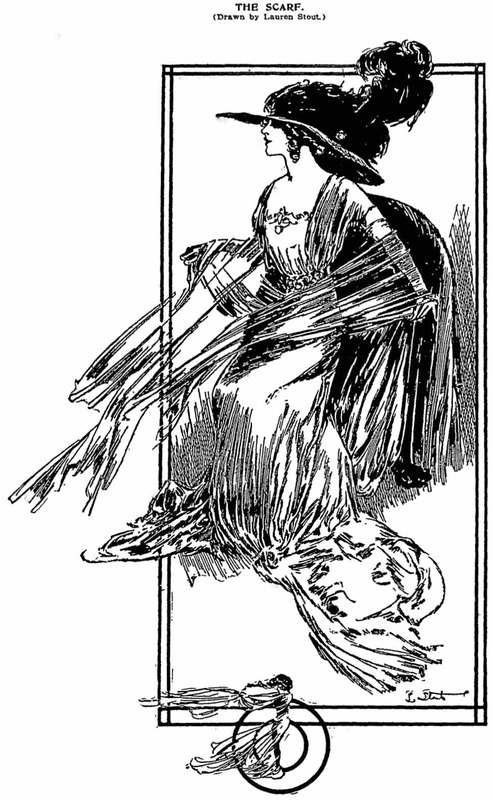 Stout was a newspaper illustrator who lived with his widow mother. The 1911 directory said Stout’s occupation was printer. At some point, Stout moved to New York City. On November 3, 1914, Stout was issued a passport. His address was 136 West 65th Street, the same as illustrator Ralph Barton, a Missouri native, who was issued a passport the same day. A profile of Barton in The New Yorker said he was in Paris in 1915; presumably, Stout was with him. 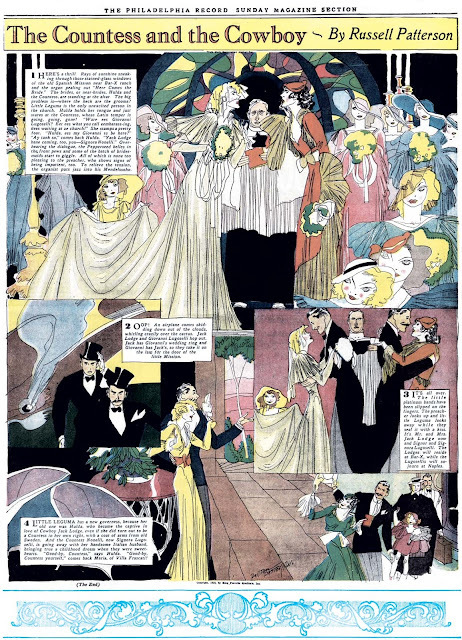 During 1914, Stout’s illustrated the serialized story, “The Valiants of Virginia”, which ran in many newspapers. On June 5, 1917, Stout signed his World War draft card. His address was 137 West 70 Street in Manhattan. His description was tall, slight build with brown eyes and black hair. Stout’s service began September 6 with the New York National Guard, Company E, 107th Infantry. Stout was overseas from May 10, 1918 to March 6, 1919. He was discharged April 2, 1919. Stout was profiled in The Seventh Regiment Gazette, May 1918 (below) and mentioned in the July 1918 issue. Stout has not yet been found in the 1920 census. In 1922, Stout was a contributor to the New York Tribune. An added feature which we feel certain will win the favor of our readers has been contracted for by this newspaper. The feature is a comic cartoon strip, by a screen star. Yes, you would guess it, anyway by Constance Talmage [sic], for what screen star indeed is more ebullient? The scintillant comedienne of the screen has been known to possess a highly developed funny-bone for these many years, else how would she have arrived at her eminence as leading comedienne of the of the silversheet? And those who know her best know that her sense of humor persists when she is totally outside the atmosphere of the studio. In other words, it is genuine, a part of her and her life, and it is superabundant, her wit and repartee have made her “the life of the party” oh those occasions when Hollywood seeks social relation. And it is not ususual [sic] for the other guests on these occasions to lend a keen ear to Miss Talmadge’s witticisms so as to have something to “spring” on their friends and acquaintances the next day. Because we know so many of our readers are numbered among the admirers of this whimsical young lady, it gives as pleasure to announce that she has decided to try to bring a smile or two to her hosts of friends a bit more often than she can possibly do it on the screen, by giving expression to her ebulliency in a series of comic cartoons. Each week we will publish one of these. The caption of the series is “Dulcy, the Beautiful Dumb-bell.” The series will treat of the experiences of a hair-brained damsel named Dulcy. Miss Talmadge is supplying the ideas for the cartoons and the speech for their characters, though the drawings wi;l be by Lauren Stout, a well-known metropolitan artist and contributor to Life, Judge and New York Tribune. Stout also spelled his first name Loren. The New York Evening Post, November 10, 1928, published a Sunday New York Herald Tribune advertisement that mentioned “Aren’t We All” by Edward Hope and illustrated by Loren Stout. A 1929 issue of New Outlook Magazine reviewed the book, Travel Trails, and said “We like the illustrations by Loren Stout.” Aren’t Men Rascals, by T. Swann Harding, was published in 1930 by the Dial Press. It was illustrated by Loren Stout. The 1933 New York City directory listed a Loren Stout at 123 East 10th Street. 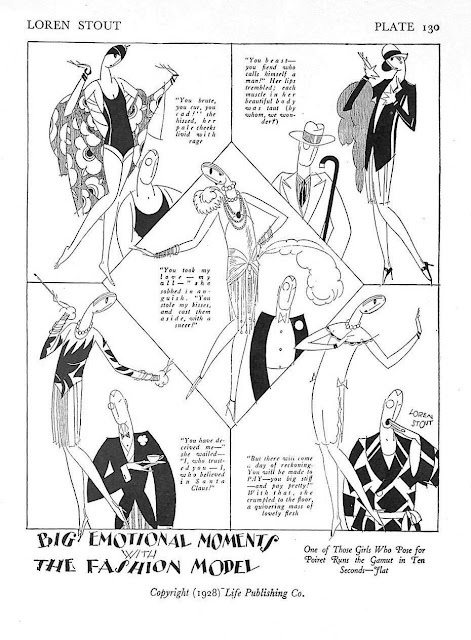 Dining, Wining, and Dancing in New York (1938) had decorations by Loren Stout. Stout was a member of the Dutch Treat Club. According to the 1940 census, Stout resided at “240-2 34th Street” in Manhattan. He was an artist working with the Federal Art Project. Stout completed four years of high school and had been unemployed for 80 weeks. Stout signed his World War II draft card on April 27, 1942. His address was 21 East 87th Street in Manhattan. Stout, who was unemployed, named Dr. Walter Dunckel as the person who would always know his address. Dunckel also had the same address. Stout and were Dunckel were friends for many years. The Fort Plain Standard (New York), November 17, 1932, reported this incident. Dr. W. A. Dunckel writes from West Kingston, R. I., that he and his family were recently in an automobile accident. The party consisted of Dr. and Mrs. Dunckel and son. 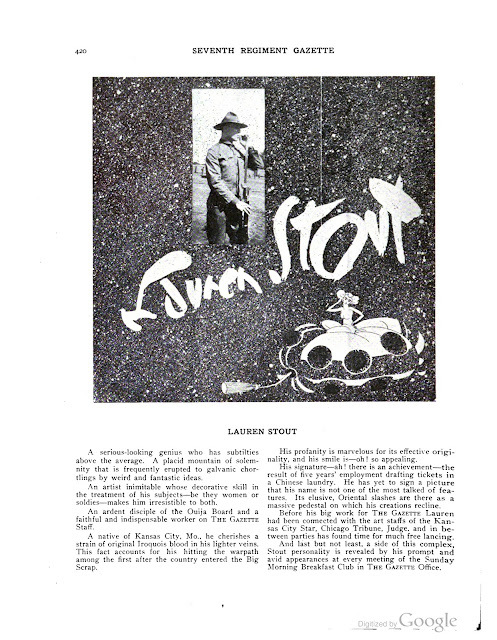 Jack, and Loren [sic] Stout, well known artist of New York city. All were injured except Mrs. Dunckel. Jack Dunckel suffered a broken leg. Dr. Dunckel and Mr. Stout are improving. Dr. Dunckel is a native of Fort Plain and his family lived here for many years in the former Bleecker house, which is now the D. A R. Chapter House. Dr. and Mrs. Dunckel were frequent visitors in Fort Plain last year during the transactions connected with the closing of the estate of Miss Lulue A. Bleecker and the sale of the Bleecker house. Fort Plain’s oldest and most historic building. Stout passed away July 9, 1942. The following day the New York Times said Stour died at the United States Veterans Hospital in the Bronx. He was laid to rest at the Long Island National Cemetery. 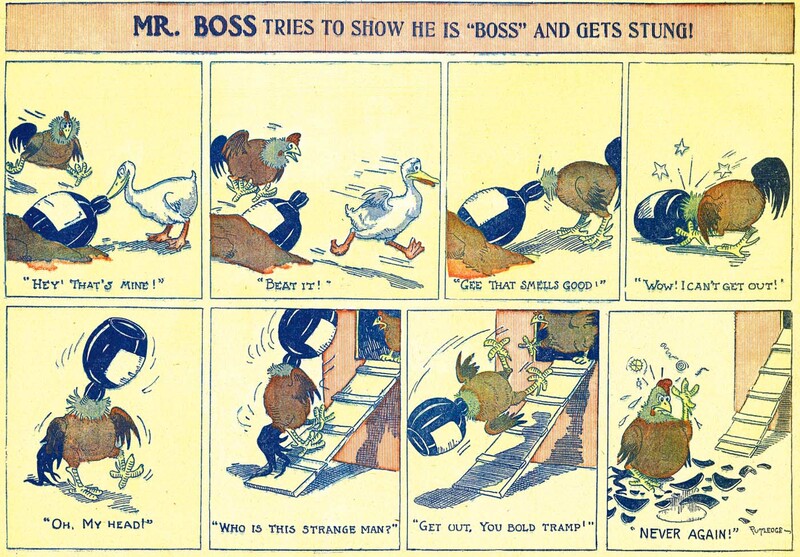 Movies have advertised themselves by way of comic strips practically since the two mediums were initially popularized. In the early 1920s and before, the tendency was to advertise the characters rather than the movie plot per se, and Dulcy the Beautiful Dumb-Bell follows in that direction. The 1923 silent film Dulcy starred Constance Talmadge as a scatterbrained young beauty who tries to help her husband get ahead in business through a wacky scheme. This scenario is about as tired a plot device as you can imagine, but in the hands of George S. Kaufman, who co-wrote the original play, and Anita Loos, co-screenwriter, I imagine it was a fun film. Sadly, the film is now considered lost. 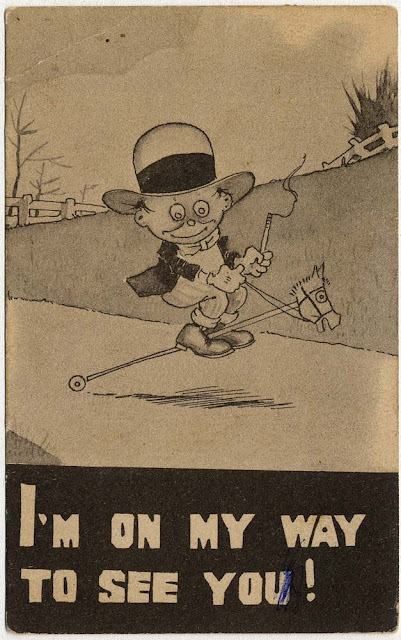 The advertising comic strip, which seems to have run for 24 installments, or four weeks of dailies, advertises the character of Dulcy by trotting our some of the most basic jokebook 'dumb blonde' jokes and managing to execute them badly. The joke writer, whoever it was, plays a mean trick by assigning writing credit to movie star Talmadge, who should have sued for defamation. Luckily, the strip looks fabulous. Lauren Stout has never been on my radar before, but the lively and highly stylized art on these strips makes certain I won't soon forget his name. Although these ad strips were handed out to newspapers for free, I have yet to find a paper that could stomach running all 24 episodes. The earliest appearance I have found is in the Harrisburg Evening News, and based on that appearance I assign 'official' running dates of July 31 to August 27 1923, though don't hold your breath looking for such an actual appearance. I’m not sure I’ve ever seen a group flop-take before! That's what caught my eye, too. These are some spectacular back flips! Althrough the 1923 version is lost, it's reamde in 1940 by MGM with Ann Sothern in the title role, It's played often on TCM, so you ought to checked it out!!! Russell Patterson was still in the phase where his women look like extras in a zombie film when he did The Countess and the Cowboy for King Features from August 14 to October 16 1932. Therefore, with just a little imagination, you can add a whole additional layer of very creepy subtext to this otherwise bland tale of romance. The above sample is the final page in the series, so SPOILER WARNING -- the guys get the gals and they live happily ever after. Who woulda guessed?